Ace Frehley is making the rounds now that his new book, “No Regrets,” has been published. The former KISS guitarist is doing a cross-country book-signing tour, as well as media interviews all over the place. Thursday, Ace was on NBC’s Today Show to talk with host Matt Lauer about the project; part of the chat revolved around Ace’s past drug use, including cocaine, for which he had a code name. 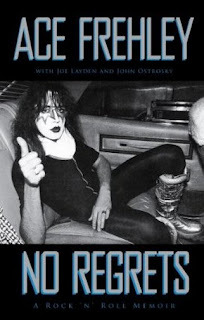 Publishers Simon & Schuster are offering Frehley fans a preview of Chapter 1 – entitled “A Bronx Tale” - check it out here.